The Wellcome Trust is an enormous UK-based philanthropic organization with a focus on biomedical research and improving the public understanding of science. 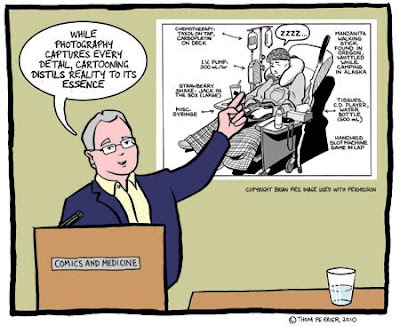 It was also a major sponsor of the first-of-its-kind Graphic Medicine conference I keynoted (is that a verb?) in London last June, and they've got a blog and a magazine for which Mun-Keat Looi, whom I met at the event, has written a nice little feature about it. From my self-centered perspective, the coolest thing about the article is the honor of being caricatured by the conference's organizer and my host, Dr. Ian Williams (aka cartoonist Thom Ferrier). I don't think a cartoonist has ever drawn me before; it's a bit like listening to a recording of your own voice. It's clearly me, yet I didn't know I looked like that. Without speaking out of turn or prematurely, I can say that plans for a follow-up conference on Comics and Medicine are in the works. I thought the first was very interesting, productive and worthwhile, and look forward to bigger and better ones to come. It is funny what makes a portrait. There is a panel in Mom's Cancer showing you slouching in an armchair. When Tina saw it, she said "Brian sits like that!" Nice to know my posture is among my many qualities that haven't improved in 30 years.